By now, you are more than aware of the many salt nicotine brands that exist within the market, and fortunately many of the ones that stand out above the rest are incredible brands that deliver a high-quality product. 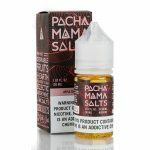 Nestled into that list is Pachamama Salts Vape Juice, a brand that consists of a salt nicotine vape juice blend in a variety of flavors, and it’s all manufactured by one of the most iconic e-liquid manufacturers, Charlie’s Chalk Dust. This company is highly known for producing incredibly unique flavors that are able to deliver ultimate satisfaction for any palette. For year’s, the Charlie’s Chalk Dust brand has graced us with a variety of e-liquid flavors. It’s one of the industry’s most iconic e-liquid brands, and they’ve become recognized for a slew of reasons, such as their attention to detail when it comes to packaging, labeling, marketing, and flavor creation. Charlie’s Chalk Dust is also an award-winning brand, delivering uniquely crafted flavors that are absolutely extraordinary. In the flavor line-up, you’ll find sweet, savory, candy, tobacco, and much more. The brand first made its entrance into the market with its White & Black Label collections and then began increasing its offerings over the years. 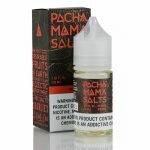 Its latest addition to its many collections is the Pachamama Salts Vape Juice line. 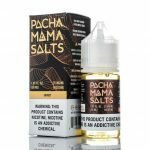 Pachamama by Charlie’s Chalk Dust has always been a brand that has received incredible attention due to its list of tropic fruit flavors, however, it has finally extended that line with a salt nic formula. You can now experience Pachamama Salts, nicotine salt blends in the e-liquid form. It brings along with it a variety of familiar flavors that has given the Pachamama collection so much success, such as the classic Fuji Apple flavor, Sorbet and more that are now available in a salt nicotine version. 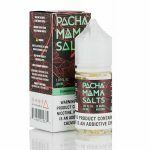 Each Pachamama Salts Vape Juice flavor comes in a 30ML bottle, features a nicotine salt formula, offers a 50/50 blend for the perfect balance in both flavor and vapor, and is available in 25MG and 50MG nicotine strengths. 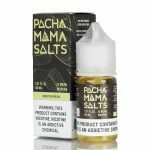 In this list of Pachamama Salts Vape Juice flavors, you’ll find a variety of flavors for almost any taste. From tropical fruits to classic tobacco, we’re certain Pachamama Salts will be your go-to vape juice when using your favorite pod system. If you’re looking for a unique, tropical fruit flavored vape juice that’s sure to satisfy the taste buds, Pachamama Salts Startfruit Grape is one that is a must try. It’s uniquely crafted with tastes of exotic starfruit and blends perfectly with a delicious, mouth-watering grape. The final result is a nic salt formula with an unbelievable taste. This Italian-inspired vape juice is one that should be added to your list as an all-day-vape. Pachamama Salts Sorb Vape Juice is the perfect Italian sorbet flavor that you can experience anytime, no long flights to Italy required. With this particular flavor, you’ll taste a marvelous raspberry that is combined with lemon, which delivers a full-bodied Italian sorbet that was designed to satisfy in every sense. There is a large crowd of vapers that can’t shake the remarkable taste of honeydew, and just about any vape juice where it’s included has always seen some type of success. 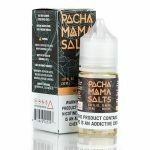 Pachamama Salts Honeydew Melon Vape Juice isn’t any different, as it delivers the sweet and succulent taste of a Honeydew Melon that feels and tastes authentic. It’s a flavor that will truly awaken every bit of your oral receptors for a thrilling flavor experience. Sometimes we find a flavor that is simply unbeatable on quality, taste, and the way it makes you feel, and Pachamama Salts Icy Mango is one of those rare flavors. It’s a complex blend that combines an intricately designed freshly ripe mango flavor with a wisp of cool menthol, resulting in one of the most refreshing mango vapes you’ll ever have a chance to try. There are many brands that have attempted this remarkable combo, but none that can deliver quite the Pachamama Salts and its Icy Mango Vape Juice. If we’re talking classics, Pachamama Salts Fuji flavor is one that many will be familiar with as it exists in the original Pachamama collection. It’s ultimately a simple flavor that utilizes a red fuji apple flavor, which was constructed perfectly by the mixologists behind Charlie’s Chalk Dust. While its description doesn’t require much to inform you, from the first taste of Pachamama Salts Fuji, you’ll notice that there’s much more to this apple-flavored vape juice than what its creators originally shared. Now that you’ve seen the flavor exists, you have to ask yourself if this is something you are willing to get addicted to because from the first draw you’ll be dazed by its delicious combination of fruits, that are ultimately some of the most sought out fruit flavors available. In this blend, those two fruits come together to create an all-day vaping experience. With Pachamama Salts Strawberry Watermelon, you’ll enjoy succulent strawberries and mouth-watering watermelons, all infused together to create a taste you won’t forget, or go without. Catering to those who prefer the classic taste of tobacco, Pachamama Salts Apple Tobacco is the one flavor from the Pachamama Salts collection that delivers the authentic taste of tobacco. To create an experience, unlike anything you’ve tried, Pachamama takes the taste of rich tobacco and infuses it with a sweet orchard red apple, presenting a brilliant blend that you will absolutely love.